Don’t look now, but the Colorado Rockies, with an 8-2 win over the San Diego Padres, are humming. Many pundits hit the panic button when the Rockies got off to their worst start in franchise history, plagued by a bevy of injuries to their battery. While Chris Iannetta’s injured list stint has added to their ailments, the club has still won three consecutive games for the first time in 2019. Ahead are the takeaways from another victorious night for the visitors. 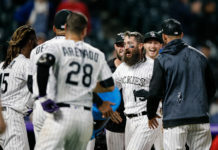 In 17 games, 12 of which were losses to begin the 2019 season, the Rockies failed to score in the first inning. In the first 16, they also failed to score in the second. 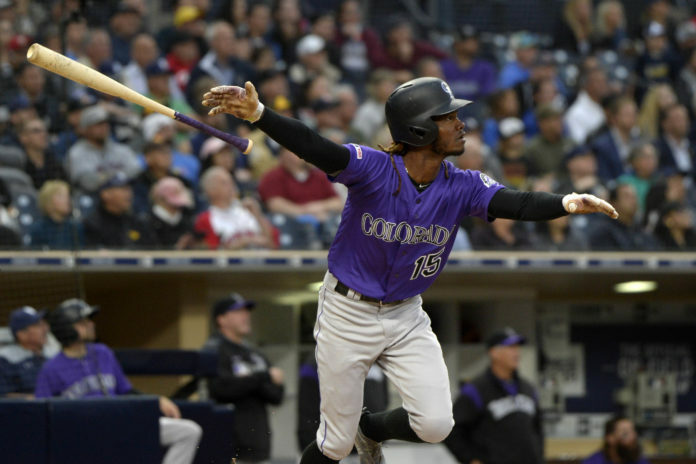 A series against the Padres proved to be the elixir for a Rockies’ offense that was sleepwalking early in games. In the opening game of a quick two-game series, Ian Desmond drove a double to right center that scored a pair, ending the latter streak. The former was ended Tuesday on a Nolan Arenado two-run home run, his third in as many contests. The long ball was also the first birthday bomb of his career. The scoreless first inning streak was the second-longest in franchise history to start a season. Along with a lack of run production, the lineup had gone 8-for-55 (.145) prior to their most recent opening stanza, a number that paled in comparison to last year’s 173-for-637 (.272). The consistent dominance of Arenado, the Rockies’ cornerstone can’t be overstated. The infielder has compiled 37-or-more homers and 110-or-more RBI’s in four consecutive campaigns. After a cold start, he’s heating back up, which is bad news for the club’s oppositions. Arenado started the 2019 season with a streak of 61 at-bats without a home run, his longest spree to begin a season in his six-plus year career. After ending his streak Sunday, he has homered in each of the subsequent two games. His latest, off Padres’ Nick Margevicius, was a 389-foot shot on an outside fastball. The three-game streak is Arenado’s fifth of three-or-more consecutive games in his career and puts him on pace for 27 this year, though that projection is almost guaranteed to be breached. The 2019 Rockies’ rotation likely rivals any roller coaster that Six Flags has to offer. Whether it’s been Chad Bettis, Tyler Anderson, Jon Gray or even the club’s pair of aces, rough starts have been a regularity. That is until recent outings. In the last six games, Rockies’ starters have combined to hurl 39.1 innings, allowing only eight combined earned runs in the process. Gray was the latest cog in the rotation to garner a quality start, going seven innings with only one earned run allowed en route to the club’s third consecutive win. The lone blemish was another home run, this time by Wil Myers. Gray now leads the National League all-time in consecutive games with a home run allowed (16). 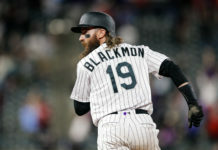 In his previous three starts, Gray had only garnered one total run of support from the offense, a total that was juxtaposed by the club’s six runs Tuesday. On the year, Gray is now 1-3 with a 3.42 earned run average. He’s also struck out 25 hitters, walking only nine. The cure to a rough start on offense? Apparently, it’s a matchup with Derek Holland, Joey Lucchesi and Margevicius in consecutive days. While the Rockies haven’t been lighting the world on fire — 17 runs in three games — they’ve put together much better at-bats. With a refined approached, the club has walked nine times in their winning streak, putting together 25 hits in the process. Early in the year, the Rockies succeeded against the Miami Marlins by way of lengthy at-bats and chasing starters out within the first handful of innings. Hitting Coach Dave Magadan has the team’s hitters once again staying patient, taking advantage of miscues from the opposition, rather than the other way around. Another wrinkle that aided them in their latest win was aggressiveness on the base paths, specifically Trevor Story. The shortstop swiped three bases in the contest, a single-game high for his career. His tally added to a team total of six. In a four-game set with the Philadelphia Phillies, led by Bryce Harper and Rhys Hoskins, they’ll need their offensive prowess to return with them to the Mile High City.